A special what-came-first-the-chicken-or-the-egg problem for writers: Does the story create the character or does the character create the story? Some writers outline the story first and fill in the characters later. Some, like me, create the character and write a story for it. I start with a rough sketch in broad strokes. Not much, just an idea of a person. Then I ask myself two questions: (1) What does he/she do? Not necessarily professionally – it can also be in terms of hobbies, as in does he/she read books? Does he/she go for long walks? (2) Who does he/she know? That is, who are the significant figures in his/her life? I draw a story out of the answers to these questions. All is usually fine and dandy up till this point, but, like any system, there’s an occasional hiccup. A recent hiccup: I wrote this character, we'll call her… mmm… Cordelia. Nice girl, although pretty stupid. I drew a nice little plot for her wherein she raised her IQ by a few points at the story's end. I started to fill in the other characters and add some dimension to her. Before I knew it, I needed to change the story to accommodate her fuller character. Nothing drastic – she was still a dumb cookie – but I couldn't go quite in the direction I originally planned. It didn't suit her. How did that happen? Yes, I know – I was busy adding dimension and *snap* – suddenly Cordelia was glaring at me, “You don’t think I’m going to do that, do you?” Why, no, of course not! How silly of me. Maybe it's only a testament to my personality that I let my characters push me around, but I'm not a total pushover, you know. If I feel my characters are getting out of hand – going from comic to tragic let's say – then I know how to bring them back to where they should be. Even when a character gets a will of its own, you can still force it to go the way you planned. You can write absolutely anything. For example, if I decide that a mini-schnauzer will be crowned king in the town square just as the sun is rising in the west, no one and nothing can stop me. (Talk about a power trip…) So if I’m so fancy and omnipotent, why do I still let Cordelia decide her own fate? 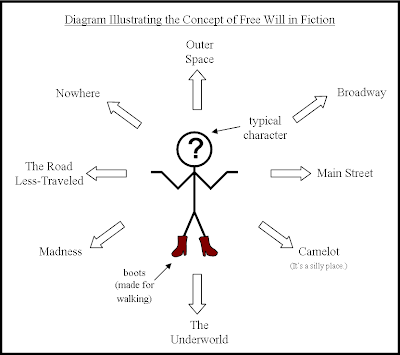 In other words, if we writers are the creators of our fictional worlds, do we make our characters follow a pre-patterned course or do we give them free will? All joking aside (really, I mean it), sometimes it’s just good sense to try to think what the character would decide if given a choice. When you write a plot, you can know where to start and you can know where you want to end up, but have no idea what’s supposed to happen in between. It’s a lot like planning a road trip from New York City to Los Angeles – there are dozens of ways to connect the dots, and characterization is a good method for eliminating some of them. Other times it’s good to stick to what you planned, however charismatic the character may be – they might simply belong in a different story. A story which you can begin writing after you finish this one, provided the character lets you have a say in the matter. Can we give a character freewill? What a question! Often we like to think we would behave a certain way when given a choice in a certain situation. Often when we find ourselves in that situation we do something completly different. So we might decide our creation will react a certain way at a certain point to go nicely down the plot lines. But when we get there and our character is facing the choice, it just doesn't feel right to go down the original plot line. So you either have to kill the character and start again with a diferrent one, or follow the original one and see where they take you! I normally follow the original one which then makes my brain hurt trying to amend the plot! Fascinating and funny and true as always, Stella. I'm sure I use some kind of method; I just never thought of it as clearly as you have. Last year I wrote a novella, going with the vaguest of plots as usual. Half-way through, I realized the character I identified with, and loved, was going to be murdered. No other way--for me it was a first. Determinism, pre-destination, free will and the characters we create. I love this type of discussion, which is possibly one reason I enjoyed Pirandello's Six Characters in Search of an Author many years ago. Must revisit this to see if it's got anything at all to do with what you're discussing here, Stella!